When you hike the Florida Trail, our 1,400 mile National Scenic Trail along the length of the state, you’ll discover places of unusual natural features and unique botanical beauty. No matter whether you’re a day hiker, a backpacker, a birder, or a photographer, these are special places in Florida that you won’t want to miss. 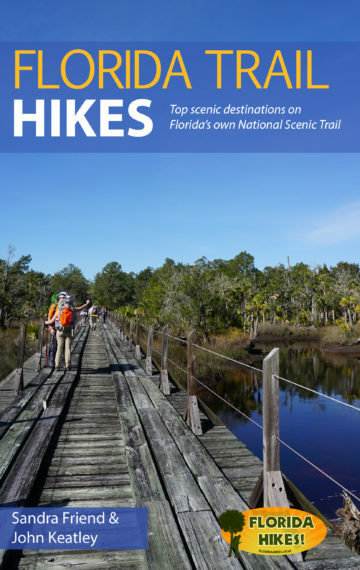 Florida Trail Hikes leads you to our favorites while also providing information about trail communities you can use as “base camps” while visiting an area. This book is designed to provide options for hikers of all abilities and interests. There are both short and long hikes, overnight trips, and even a few accessible sections that can also be biked. Unlike The Florida Trail Guide, which is focused on logistics of planning a hike, this book is about the why. It includes rich descriptive details, color maps, and color photos to inspire you. Grab this guide and go take a hike! PRODUCTION DELAY: Up through October 2018, it had been our plan to publish a full series of books showcasing the best day hikes and short backpacking trips along the Florida Trail across three vast segments of Florida. However, with our Northwest Florida book just about to go to press for an early December release when Hurricane Michael tore through the Florida Panhandle, we’ve pulled back from the multi-book idea to focus on one single volume. Recognizing that any given hurricane could trash ALL of the trail in one region, we are picking “the best of the best” of the Florida Trail across the entire state of Florida to share in this new book. We’ve pushed production into summer 2019. Join the pre-release mailing list and we’ll keep you posted! RETAILERS: This book will be available within the United States at a wholesale discount. Become a reseller.